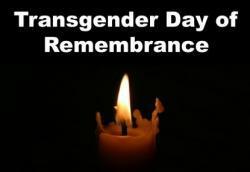 Last year we reported on the Transgender Day of Remembrance event at Plymouth UCC in Grand Rapids and this Sunday people will gather to participate once again in this important event. Come join Transgender Education Collaboration, Plymouth UCC, and the rest of our community remember those who were taken away from us in the last year because they didn’t fit neatly in expected gender roles. Also, share in the hope and joy that comes for the amazing talents that shines within the diversity among us.